Nongket Yai. 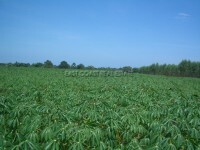 A 12 rai plot of land available in an attractive position. Located in the Crocodile Farn area, there is easy access to the motorways to Rayong and Bangkok. The size is suitable for a good sized village. The plot already is walled in, and electric supply is in close proximity. available for sale in Thai Name, with Tax & Transfers being split 50/50.